A race not to be compared to any other competitive event in the world, the Iditarod Trail Sled Dog Race covers over 1,000 miles of the roughest, most breathtaking terrain in the world. From Willow in Southcentral Alaska to Nome on the western Bering Sea coast, the Iditarod pushes mushers to their limits on a gorgeous and unforgiving trek across the state. Rookie Geir Idar Hjelvik from Norway sparked an interest in the Iditarod when his first litter of Alaska pups was born in 1989, bloodlines from world-famous musher Susan Butcher and Jerry Austin’s dogs. Hjelvik lives in Norway and began thinking seriously about the Iditarod after a couple of competitive finishes in Norway sled dog races. While maintaining a kennel of dogs back home, Hjelvik plans to run a team from three-time Iditarod champion Dallas Seavey’s kennel in this year’s race. When not mushing dogs, Hjelvik is a father and competitive Norwegian folk dancer. Many people dream of racing in the Iditarod and rookie Larry Daughtery is no stranger to that dream. Daughtery moved to Eagle River, Alaska, in 2014 and is a practicing radiation oncologist at the Alaska Cancer Treatment Center in Anchorage. He says he came to Alaska to fulfill two dreams: to bring the best possible cancer care to Alaska and to race in the Iditarod, a goal that was instilled in him as a kid, inspired by his grandmother who loved the race. While the majority of mushers grow up around the sport, rookie Mary Helwig didn’t have her first experience on a sled until age 23, when she moved to Unalakleet, Alaska, to work as a youth leader in the local church. 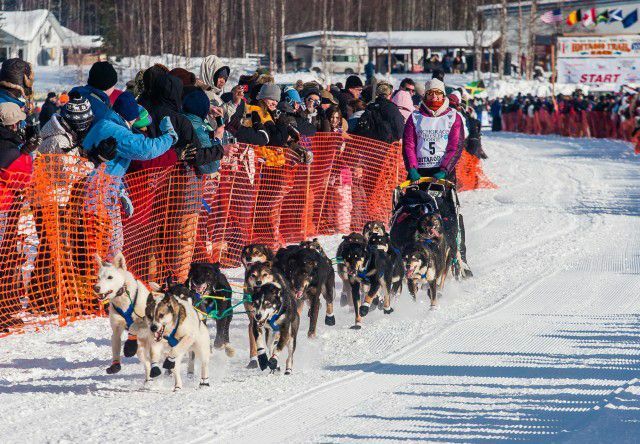 Helwig said she had her first experience on a sled during a short women’s dog sled race organized by the Norton Sound Sled Dog Club and was “instantly hooked.” After running her first mid-distance race in 2011, she formed her own team in 2013. After losing her home and nearly all her belongings in last summer’s Sockeye wildfire, she has proved to be resilient, now even more determined to run her first Iditarod race. Good luck, mushers, and may all your rookie dreams come true! Don’t miss out on Skagway’s new photo opp!